What goals did you set in 2018? Did you meet them? What made you happy in 2018? What made you sad? Where did you succeed? Where did you fail? Why did you succeed? Why did you fail? Now, these are just a few questions to get started – feel free to add to the list! Basically, you want to review everything, in order to improve for 2019. Once you have your answers, you can move forward, avoiding the things that were bad for you, and focusing on the good, which will help you reach your goals and make you happier, as well. Now, it’s your time to set your goals! Remember, if you set a goal that failed last year and you want to set the same goal again, figure out why it did not happen last year and how you can make it happen this year. 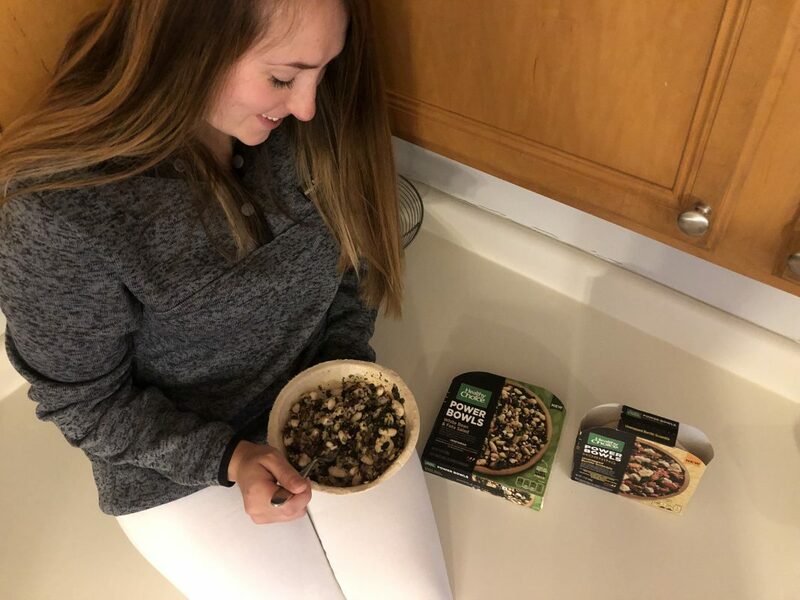 So, if you had a goal of eating healthy last year and it failed, figure out why it failed and how you can prevent the same thing from happening in 2019, so that you can rock that goal this year! My biggest tip that I can give you is to create one main goal for the entire year and then set smaller, attainable goals to help you reach that big goal. A lot of the time, if you only set one big goal, you lose sight of it along the way because it seems unreachable, but if you set smaller goals that will help you reach your big goal, it is much easier to keep going because you see progress along the way. Just keep marching on and you will get there! You are the only one that can make your goals happen for yourself, so don’t complain and just make it happen for yourself! My goal in 2019 is to surround myself with more joy. In 2018, I started working out with my trainer at Hustle House Health and Wellness. It has been life changing! I’ve learned that my body is so much stronger than I ever thought it was and I’ve pushed past so many of my workout fears, such as running (I still die when we do hill sprints, though). This year, I’m setting big health goals for myself. I want to not only keep up with a consistent workout schedule at Hustle House, but I also want to focus on eating better and also doing some stretches and maybe even walks (or jogs?!) at home, too. 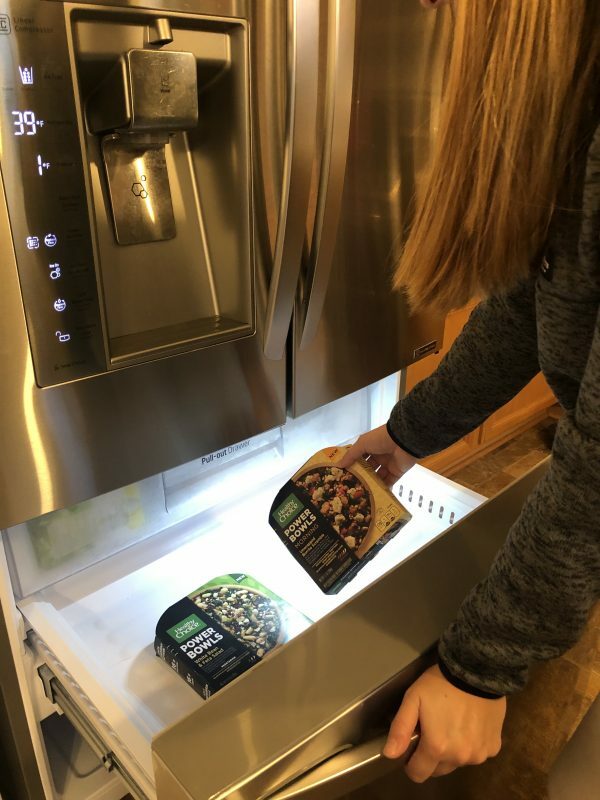 Although Ian and I have pretty much no time (at all) right now – especially while Payton is recovering from her CCL surgery – we are still trying to keep up with our healthy eating. 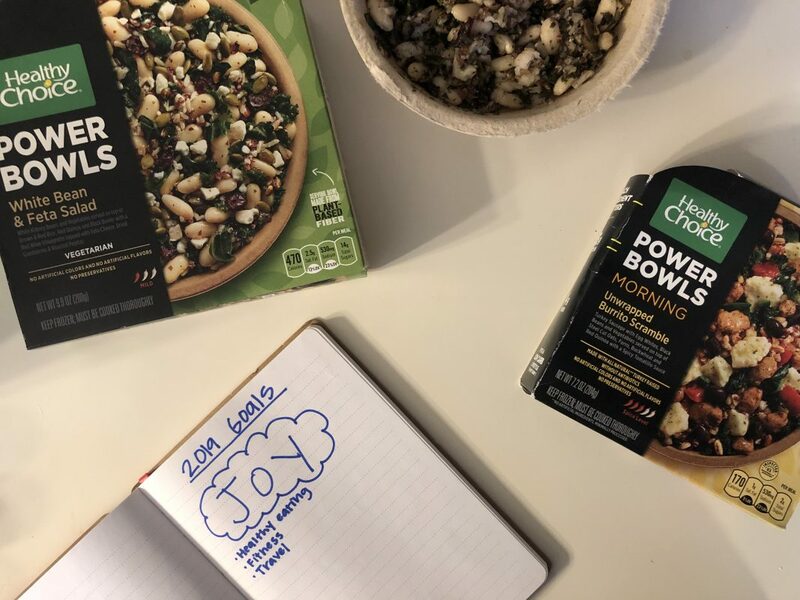 Luckily, it has been relatively easy to do so with the new morning, as well as vegan and vegetarian power bowl lines from Healthy Choice. 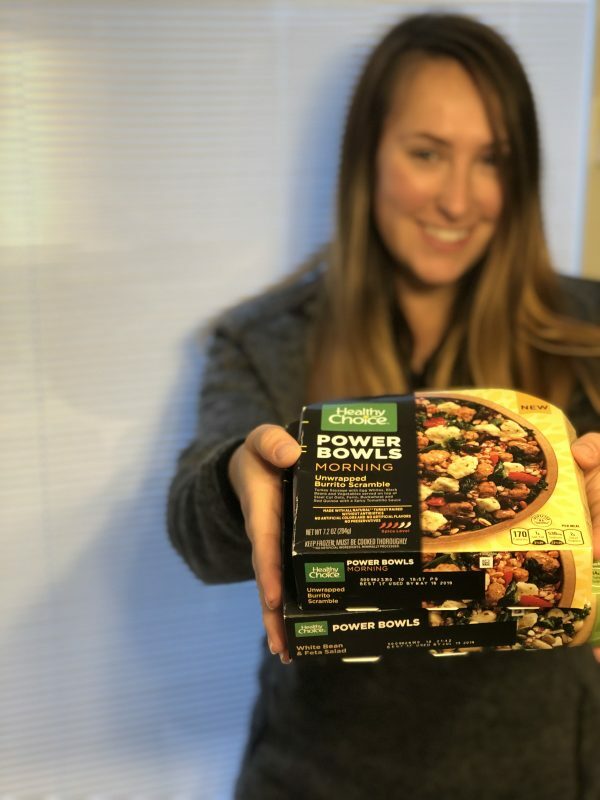 These power bowls were created for the health-conscious, time-starved consumers because it is a quick and nutrient-dense addition to breakfast. Each morning power bowl includes purposeful ingredients such as turkey sausage, egg whites, farro, quinoa, and plenty of greens, for a well-balanced meal. While Pay is recovering, I have very little time for myself. Literally yesterday I only got up once during the day (to grab a glass of water and get her medicine), so these have been so insanely handy since they are so quick and easy to make. So far, I have tried the white bean & feta salad power bowl and the unwrapped burrito scramble. I was so impressed with not only the ingredients in these, but the taste, and the ease to make them, as well. 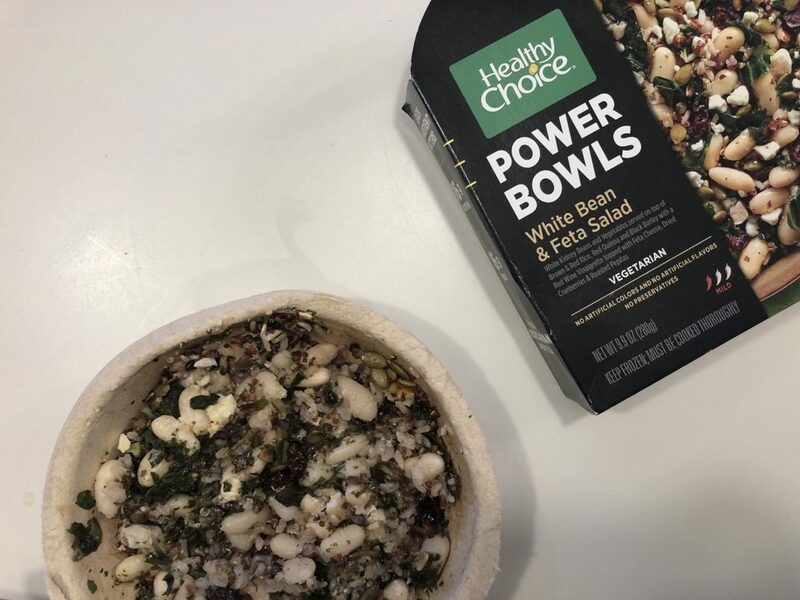 The White Bean & Feta Salad is filled with white kidney beans, kale, chard, and spinach served on top of brown and red rice, red quinoa, and black barley. It’s topped with a red wine vinaigrette with feta cheese, dried cranberries, and roasted pepitas. Talk about yum (especially for a veggie bowl!!). These ingredients deliver nutritious benefits like 10-16 grams of protein and 7-16 grams of fiber! 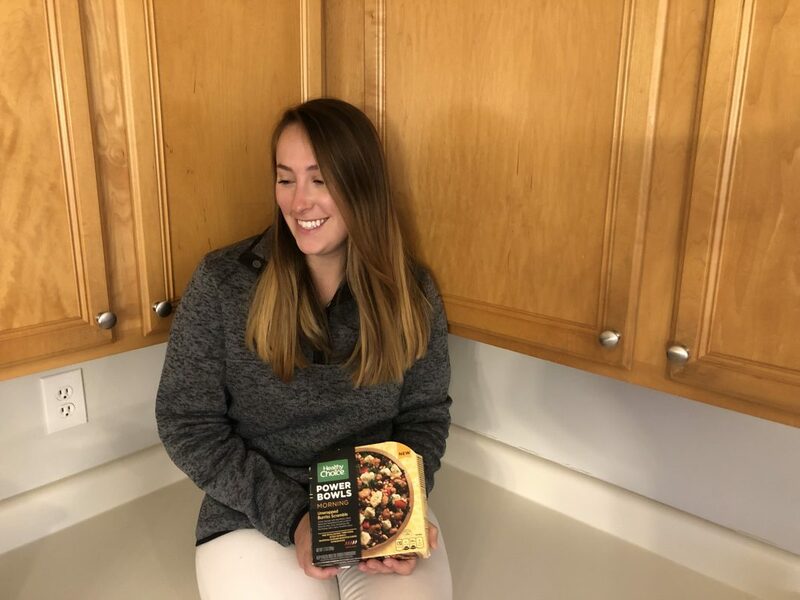 The Unwrapped Burrito Scramble from Healthy Choice consists of turkey sausage, egg whites, black beans, vegetables, steel cut oats, farro, buckwheat, and red quinoa with a spicy tomatillo sauce. I don’t know about you, but that’s definitely up my alley when it comes to good food. These ingredients deliver nutritious benefits like 10-15 grams of protein and 3-5 grams of fiber. So, that’s how I am working on my healthy eating when I am busy. 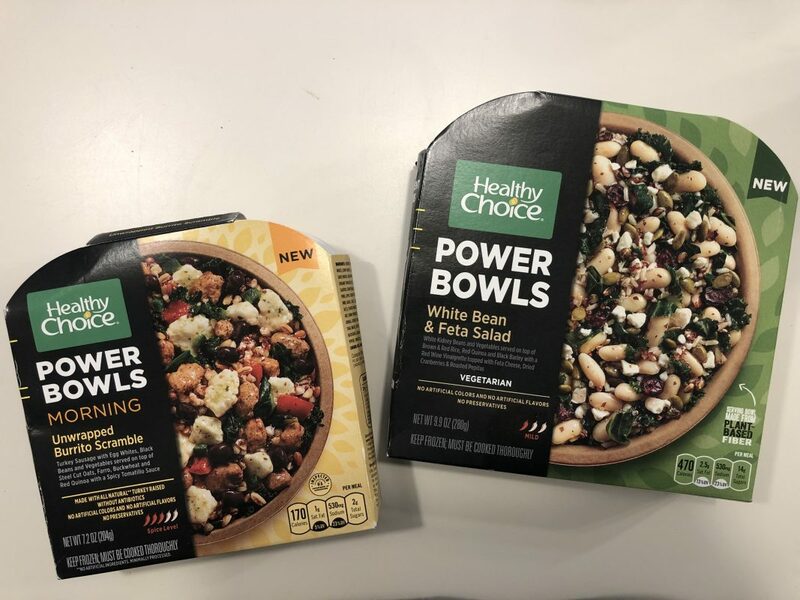 These tasty morning, as well as vegan and vegetarian power bowls by Healthy Choice just make it so easy! I’ve heard a lot of talk about quality over quantity lately and I am all for it! Over the past year, I’ve learned that I really prefer a close knit group of friends compared to a million “friends” (that really aren’t your friends). Now, I’m really focusing on quality friendships. I want to be able to foster those relationships (friends and family!) and get back what I put in. Another great example of quality over quantity is with work. When I first started writing, I would pump out the articles as fast as I could. I thought that I would grow my audience with more articles or Instagram pictures, but I was way off base. Now that I am posting (and working) less, I have significantly more traffic. In fact, I have more traffic than a lot of bloggers and I am a lot less stressed, as well since I do not have to feel pressured to constantly post. Although these are just two examples, I could go on and on about quality over quantity. I highly recommend implementing it into your life, as well! Okay, so obviously, stressing less will make me happier, which is the ultimate goal. Ian and I are also trying for a baby for those that do not know and stress is a huge factor when it comes to successfully getting pregnant. I noticed in 2018 that I was CONSTANTLY stressed out – literally every single day – and I really want to change that this year. Stress is so bad for you! Stay tuned because I definitely want to write a full blog post about how I am stressing less in 2019! This is a huge goal for me in 2019. I mean, it could basically be my “main” goal – that’s how big it is. I want to get out of my comfort zone and do more things that scare me and so far, I’m starting off 2019 with a huge bang – I’m doing a speaking engagement with my friends over at Dinova! Eeeeek. This is totally terrifying to me, but I am so excited to step out of my comfort zone and learn about how I can better myself and grow from this scary (and cool) opportunity. I truly do think that doing things that scares you is so, so good for you and I really hope that by facing some of my fears, it will help me stress less and create more joy in my life. There you have it – my goals! I am working on all of these smaller (but not so small) goals in order to reach my main goal of more joy in my life. You’ve heard mine, so now I want to hear yours – what goals are you working towards accomplishing this year?! You are going to learn how to become a goal digger in no time!